For the past 6 months, I’ve been working on an amazing and ambitious project. 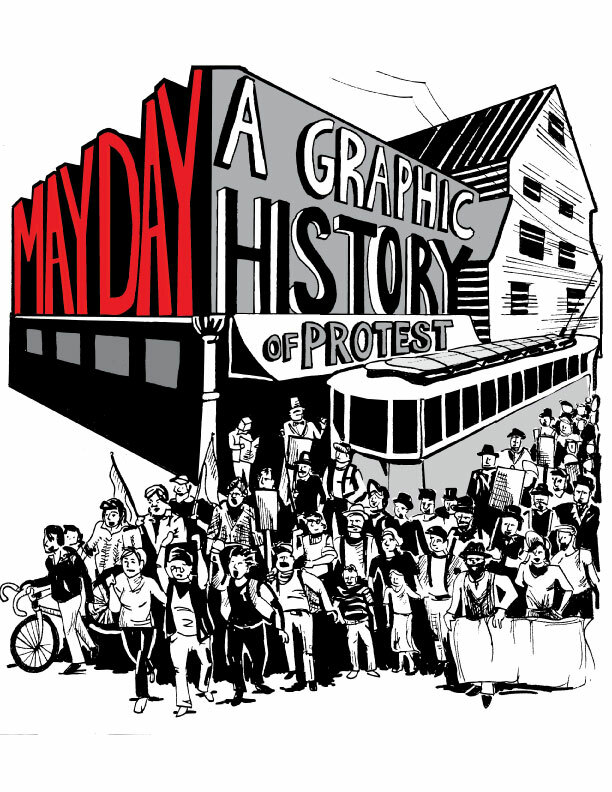 The project was to co-illustrate a 24 page comic called May Day: a Graphic History of Protest. For centuries, May Day has been the historic day to celebrate the struggles of working people, and it has a rich history in Canada. Co-illustrated with Trevor McKilligan, it’s written by Sean Carleton, Robin Folvik, and Dr. Mark Leir at Simon Fraser University. “The work we do defines how we live, and how we fit into society. We’ll be showing all the images in a slide show at a launch and May Day cabaret on May 1st at Rhizome Cafe. The printed comics will be ready by the end of May and I’ll post information about that later. This was my first multi-page comic. I spent the first week drawing random images and being nervous about telling a consistent story with characters. When I got stuck I went for a bike ride or read other comics. The great part about collaborators is that you can work together to make it come alive. I thought a lot about changing my doodles, too. I doodle constantly: circles and furniture, patterns, leaves, strange faces, and habitually my little bonhommes. My bonhommes are small, androgynous, blobular people with spiky hair and stick legs. They’re a lazy shorthand for an interesting image, like a graphical version of bad handwriting. I told myself, “there can’t be page after page of tiny bonhomme revolutionaries.” So I got to work researching and practicing. I asked my drawing-mind to transform the drawings from crowds of tiny blobs into individual faces with stories to try and do this script justice. I conjured a picture in my head to follow, and the bonhommes began to morph into real shapes. It was like they were ready to come alive, but I had never asked. Putting together a comic has many layers (and emails and meetings). First, I drew small, thumbnail sketches to show the writers where I was headed. Then I took 11×14 bristol board and markers and drew large sketches to secure the layout while the script was being finalized. Once the layout was secured, I drew in the lettering, then pencilled the images on new 11×14 sheets. I decided to ink with markers so my lines would be consistent. After spending $30 on different pens, I decided that the Stadtler pens were simplest, cheapest, and best. I inked everything with pens in different widths, and fixed mistakes with gouache. The day that Trevor and I photocopied the first inked sheets down to 8×5 x 11 to see an approximation of the final product, it was a great day. We did the cover last, that’s the image you see above. Trevor drew it and I inked it. Hi Ryan, the comic was first published in 2009 so that demo didn’t make it in, sadly. We’re starting work on a second, longer one and I’ll make a note to research NOII events in Toronto for inclusion. Thanks!